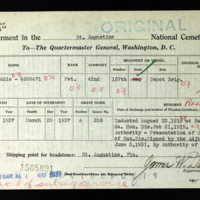 The interment card for Eddie Landrum (1899-1937). Interment cards are control forms for burial lots in national cemeteries. They provide the details of name, birth, rank, serial number, units and wars served in, enlistment, dischare, death, interment date, gravesite, and next of kin. According to this card, Eddie Landrum served in the 42nd Company, 157th Depot Brigade as a Private. He was inducted on August 22, 1918, given an honorable discharge on February 21, 1919, and died March 24, 1937. The card lists his interment site as Section A Grave 208 in the St. Augustine National Cemetery in Florida. Elijah L. Landrum, who went by Eddie, was born on July 3, 1899 in Sandersville, Georgia, the son of a farmer and a farmer himself before the war. This occupation was common of African American men living in the rural South. Like many others, Landrum registered for the draft once the United States joined the war. However, as he was under the age of twenty-one, Landrum listed his birth year as 1895 to be eligible. On August 22, 1918, he was drafted for service and sent to train at Camp Gordon, just northeast of Atlanta, Georgia. After, Landrum served as part of the 157th Depot Brigade, which remained in the United States to receive, train, and uniform new recruits who would then be sent to fight on the front lines in France. After the war ended, Landrum was discharged and returned to his work as a farmer. He married, and eventually settled in St. Augustine, Florida. On March 24, 1937, Eddie Landrum passed, and was buried in the St. Augustine National Cemetery. 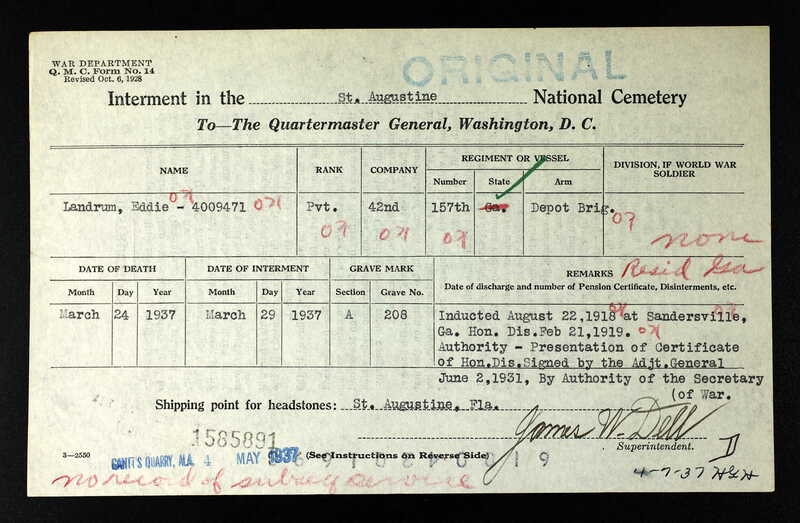 Digital reproduction of original typewritten interment card: Records of the Office of the Quartermaster General, 1774-1985, Record Group 92. Originally created and published by the Office of the Quartermaster General, Memorial Division. Office of the Quartermaster General, Memorial Division. “Interment Card, 1937.” RICHES of Central Florida accessed April 22, 2019, https://richesmi.cah.ucf.edu/omeka/items/show/10374.